For travellers looking forward to their summer holidays, what to pack can be a source of stress. But did you know that taking an e-cigarette with you to countries such as Thailand could land you with a fine – or even time in jail? Countries including the Seychelles and Brazil have also banned the sale of e-cigarettes, but spending on them globally is going up. These charts tell the story of a growing industry – but how many people vape, how much is being spent on e-cigarettes and why do people buy them? The biological and clinical evidence that e-cigarettes are really bad for health are rapidly growing. Now, the first evidence linking e-cigarettes with chronic obstructive lung disease (COPD) and laryngeal cancer is raising serious concerns about users of these products and has the public health community sending warning messages to everyone that not only there is no proof that e-cigarettes are less harmful than smoking but that they may very well be even more risky. Reading the latest story about vaping in today’s newspapers, you could be forgiven for thinking that it was still 2011. When e-cigarettes first became mainstream products, concerns were expressed about them being a “gateway” to tobacco and “re-normalising” smoking. As the years passed it became clear that these fears were unfounded. Every country that has embraced e-cigarettes has seen smoking rates decline among both adults and children. The idea that substitutes for smoking would increase smoking makes as much sense as the idea that sugar substitutes would increase the use of sugar.
.@BenFordham: The immediate past president of the AMA has come clean about his stance on e-cigarettes, saying he’s ‘open minded’ on their benefits. May 31, 2018, the World No Tobacco Day. This is an(other) day to be reminded about the deadly effects of tobacco cigarette smoking. This global problem is not only related to the fact that 50% of smokers die prematurely (losing on average 10 years of life) from smoking related disease. It is even more importantly related to the large prevalence of smoking worldwide. There are more than > 1 billion smokers globally. And this is not only a problem of the developing world. The European Union still has a smoking prevalence of 26%, while Greece has a prevalence of almost 33% (according to my latest study). World Smokefree Day is an apt day on which to propose some ideas that may greatly increase momentum for the achieving Smokefree Aotearoa 2025. Tobacco and vaping products such as e-cigarettes vary greatly in their likely adverse health effects and overall impact on population health. Reflecting this, the Ministry of Health announced in May that it will investigate ‘risk-proportionate’ regulation for tobacco and vaping products. Face facts: some smokers will never quit. How can we make World Smokefree Day irrelevant by 2025? Snus finally arrives in New Zealand! NZ Smokeless Tobacco Co (NZSTC) is proud to present NZ SNUS. www.nzsnus.co.nzis the one and only online retail outlet that will start selling snus on World Smoke Free Day (31st of May). A leading GP and anti-smoking campaigner in Whanganui is now actively promoting vaping as an option for people trying to quit smoking. Dr John McMenamin is the clinical director of Whanganui’s Stop Smoking Service (Ngā Taura Tūhono) and a GP at Wicksteed House Medical Centre. A recent report by The New Zealand Initiative Smoke and Vapour: the changing world of tobacco harm reduction calls for a range of smokeless nicotine delivery products (e-cigarettes, snus, and heat-not-burn) to be made available to smokers wanting to cut down or quit. Research Fellow and report author Jenesa Jeram says: “In order to help people quit smoking, policymakers first have to understand why people smoke in the first place. It comes as the president of the Australian Medical Association defended the government’s strict policy against changing its stance on e-cigarettes. Experts from the University of New South Wales’ School of Public Health and Community Medicine and the Australian Drug Law Reform Foundation, along with GPs and addiction specialists have joined forces to form the Australian Tobacco Harm Reduction Association (ATHRA). 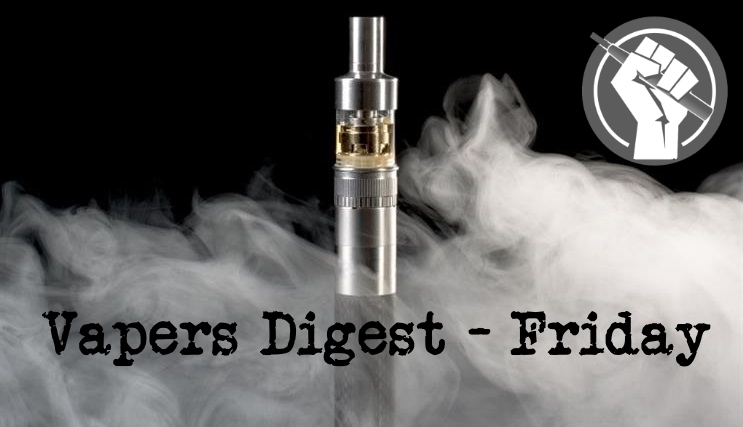 TPD 2 legislation came into force last May and required e-liquids containing nicotine to include child safety measures, banned certain chemicals and made health warnings mandatory. However, those without nicotine remain a largely unregulated “grey area” with many retailers who spoke with Retail Express unsure of the age restrictions, legality and origins of many of the products on the market. This week, Reynolds Tobacco is reported to be funding the fight against the San Francisco flavour ban to the tune of $12 million. In Pakistan, it’s reported that there’s a surge in teen vaping in Rawalpindi and Islamabad. A Kuwaiti drug dealer has been arrested for ecigs that don’t contain drugs. So he isn’t a drug dealer. In the UK, vapers are being told ‘don’t vape and drive’ while the Doozy Vape Co gets listed in Asda. You may remember anti-smoking tax spongers telling us that they’d found out kids don’t like ugly things, which is true but has nothing to do with whether they’ll take up smoking or not at some point. They also said that smokers had said an ugly packet might make them ring a quitline, but not whether they would actually quit smoking. Earlier in May, eleven Democrat senators appeared to be channelling talking points from the Campaign for Tobacco Free Kids when they wrote a letter to the incoming FDA Commissioner Dr Scott Gottlieb. Today is World No Tobacco Day and to mark the occasion the Brussels-based Smoke Free Partnership – whose members include ASH and Cancer Research UK – held a lunchtime event at the EU parliament.